Warning: Here be minor spoilers. I collect cool words. It started with Daniel Okrent’s Last Call: The Rise and Fall of Prohibition: words like calumny, bugbear, abstemious, and postprandial popped out as I read that great history of Prohibition a few years ago, and I wanted to remember them, so I wrote them down. I’ve done that with my reading ever since, including with The Word Exchange, a new novel from Alena Graedon (out on April 8). Fitting for a novel about dictionaries and language, Graedon was dropping cool words all over the place. I was racking up words I wanted to look up later and try to remember for future reference. But then something weird happened. The Word Exchange is about the near-future, when the printed word and the things that house it (libraries, bookstores, magazines) have become obsolete thanks to the Meme, an iPhone-esque device that anticipates its user’s needs and intuitively delivers information. The Meme has become so thoroughly integrated into everyday life that users no longer need to remember word definitions; the Meme knows them and can retrieve them immediately. Because everyone is so dependent on their Meme for almost everything, including basic word definitions, they trust implicitly whatever the Meme tells them. But something foul is afoot with Synchronic, the company that manufactures the Memes. For one, it has started buying words and creating new ones for their online marketplace called the Word Exchange. By creating their own repository from which the Memes pull their data, Synchronic’s users become locked in to the company’s proprietary language, which continues to expand with new user-created words that mysteriously (or not so mysteriously) begin taking the place of known words. In other words (ha! ), Synchronic’s Meme isn’t freely delivering word definitions from the public domain; it’s selling an inferior product when its users could get better stuff for free. But in the Meme’s seamless digital ecosystem, quicker is easier than better. Synchronic’s newest device, the Nautilus, takes the next logical step: it’s an electro-biological headpiece that integrates with the user’s brain on the cellular level, allowing for direct and instantaneous communication with the Internet. It would also further meld Synchronic’s manufactured language with its users’ own speech patterns. But that becomes a problem: a new epidemic, dubbed “word flu,” starts infecting Meme and Nautilus users’ speech with artificially manufactured words and wreaking havoc on their bodies. And this is where the weird began for me. I had written down about a dozen cool words I wanted to remember, like amanuensis, ouroboros, ken, and variegated. Then I ran into a new word I was about to write down when I recognized that it wasn’t real. It was a Synchronic™ word, so to speak—a word created and sold by this secretive company that had snuck into the vocabulary of someone infected with the word flu. Until this moment, I had been an outside observer of the novel’s narrative, watching the characters navigate the shadowy goings-on in this vaguely dystopian near-future. But then I suddenly had a linguistic object lesson that made the novel much more present and prescient. 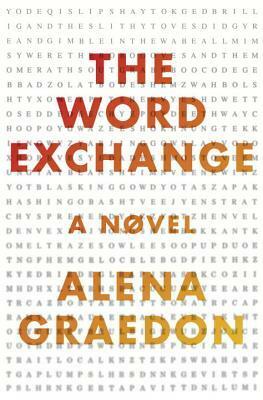 As a word-themed dystopian thriller, The Word Exchange is right up my (dark) alley. Graedon has a knack for description, though I ironically was most put off by the technical side of her writing style, i.e. an over-reliance on the em dash. Incredibly pedantic, I know, but such is the life of an armchair grammarian. Perhaps this and other choices were conscious and character-driven; if so, very well then. By the look of her Facebook page, Graedon has taken on a kind of skeptical techno-prophetess role to promote the book and guide the discussion around its highly relevant and pressing themes. She can certainly count me as a supporter in that regard.